Children and OCD | Does Your 3-Year-Old Have OCD? MMy heart aches for Riia Talve's parents. Due to an unexpected illness, Pennie and Henry Talve's baby girl had to be induced early or die. To the overwhelming joy of this British Columbian couple, it was a success and the diminutive Riia was born at 1lb 13oz. To make matters worse, at one month Baby Riia suffered a grade 3 brain hemorrhage. Pennie and Henry's infant daughter spent her first 7 months of life in a special care nursery. It is no wonder that Penny and Henry kept a close eye on their daughter's development as she grew. Given this beginning, Riia admits that she was very lucky. "I would have bouts of forgetfulness. Not just absent-minded but forgetting how to perform tasks. I had to relearn how to set the table, for example. I spent hours of my childhood trying to learn how to read an analogue clock. Reading was never any problem, but math was and is extremely difficult." Through careful and close observation of their young daughter, Riia's parents identified another puzzle which would ultimately be diagnosed as Obsessive Compulsive Disorder (OCD). OCD is a mental health disorder which occurs when a person gets caught in a cycle of obsessions and compulsions. According to the International OCD Foundation, obsessions are unwanted, intrusive thoughts, images or urges that trigger intensely distressing feelings, while compulsions are behaviors an individual engages in to attempt to get rid of the obsessions and/or decrease his or her distress. 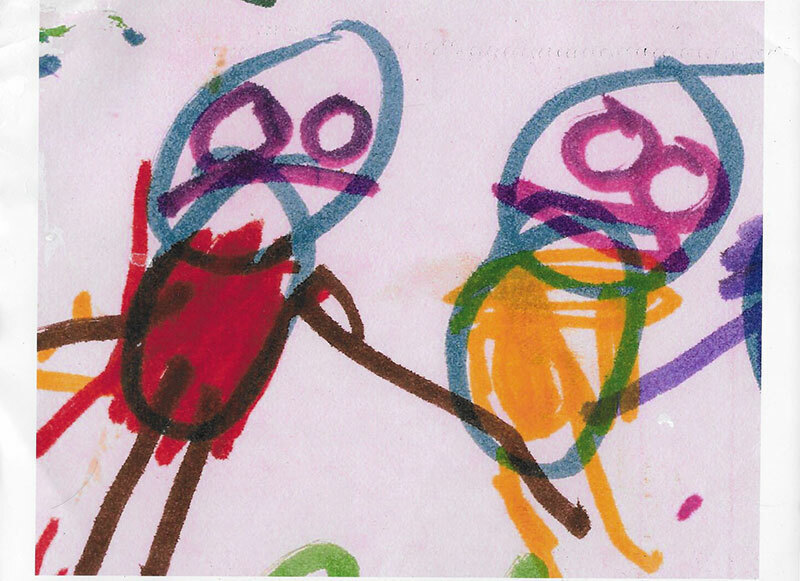 Even early on, Riia exhibited signs of anxiety and agitation, as seen in the painting above, done at age three. Compulsions plagued her, like making sure the stove was off, which Riia describes as an unrealistic fear. "If the stove isn't turned off what If someone gets hurt and I get blamed? It would be my fault! Mom and Dad noticed this early on and encouraged me to draw to distract myself from the anxiety. I would paint my obsessions to get rid of them. " In speaking with Riia and viewing her art, it is clear OCD is an entity to her. She says, "My mind would constantly tell me 'You have to do this, and you have to do it right and you can't make any mistakes!' I learned to recognize when OCD is coming, and I'd write or read or paint before it gets me. I have to close the door on it before it enters and takes over. If I can catch the obsession before it starts, I can get through it." This painting is called "Go Away." Riia describes it as trying to shield herself from OCD. Even as a child, Riia still suffered the effects of the brain hemorrhage. Due to a weakened immune system and underdeveloped lungs, she couldn't go to public places and socialize with other kids. At school she was put into a resource room which is a segregated classroom for kids with learning disabilities. There were two teachers helping all the students, but not much peer interaction—an ongoing theme in Riia's life. "I liked drawing people because it is supposed to be the hardest thing to draw and I was good at it," Riia states honestly. "I got good attention from it." Then, after 17 years of segregation and solitude, things changed: Riia was accepted into the prestigious Emily Carr University of Art + Design in Vancouver. 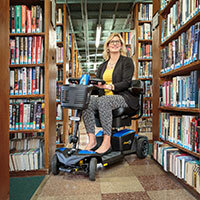 "For the first time I felt that teachers looked at my abilities, not my disabilities," Riia remembers wistfully. "It was nice to be a 'normal' student, treated like everyone else; nice to feel what it was like to be a normal person." 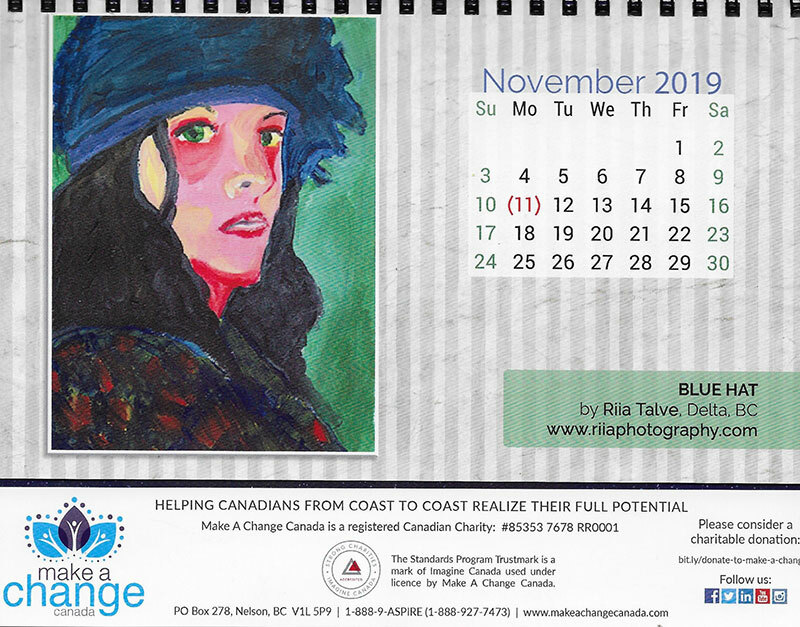 After college, Riia quickly reached her goal to use her art to do promotional materials. In record time, she was applying her considerable skills to make book covers and advertisements for local businesses come alive! 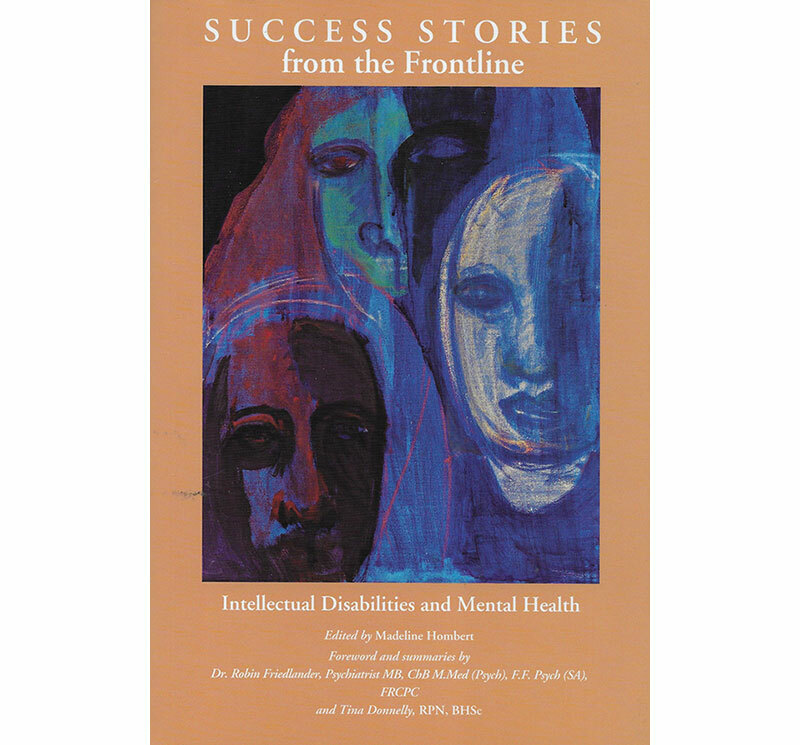 The book cover for Success Stories from the Frontline: Intellectual Disabilities and Mental Health features her remarkable artwork. 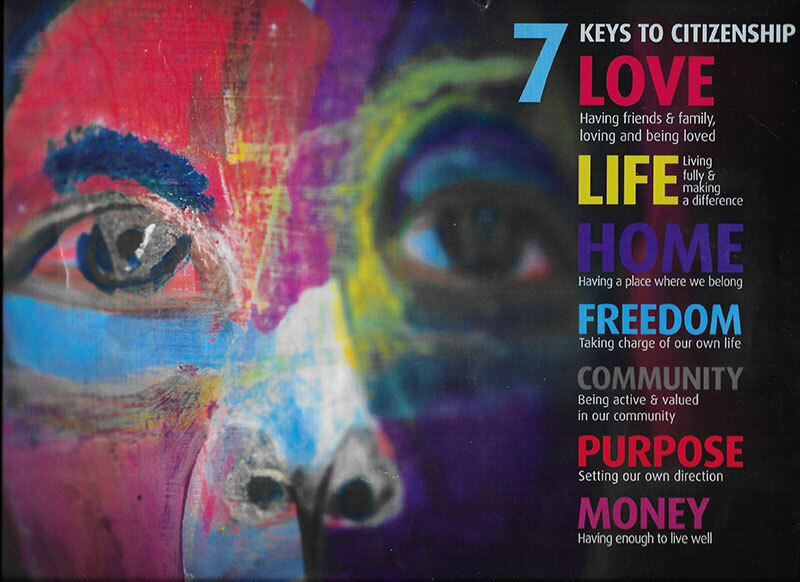 A poster outlining the 7 Keys to Citizenship showcase her unique sense of color and design. 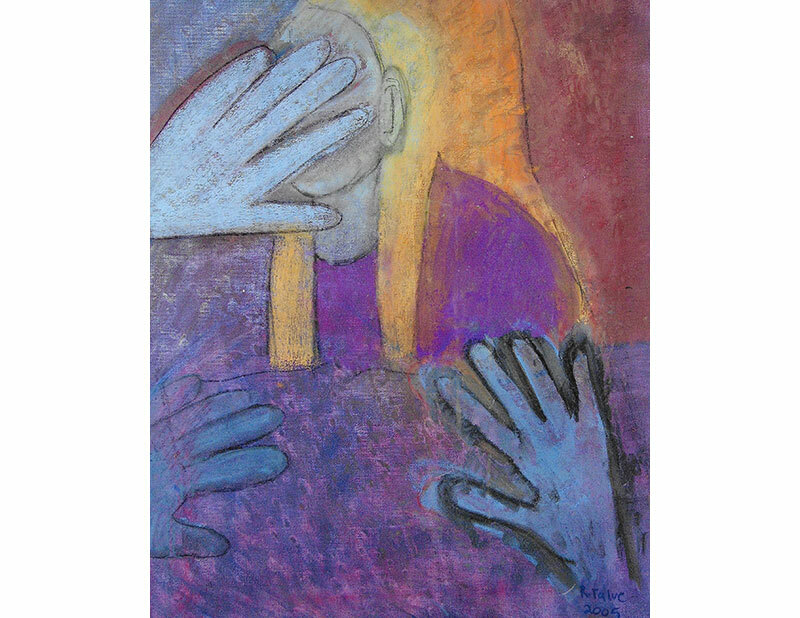 Riia had reached her goal: To convey what it is like to have a mental health issue through art. When asked about her next steps, Riia has the picture. "I enjoy helping people, hoping what I have been through will help others. When I spoke to that group of 200 people It was cool to present my story, show my artwork and stuff. That's what I want to do—through my life story I can show people that they have the tools to shut out the anxiety." "When I was first diagnosed at age 15, my first thought was 'Oh no, I'm totally different now!' But on the other hand, I was relieved. Once it had a name, I realized I wasn't totally alone. By telling my story and showing my art, I put a face to OCD. People need to know they aren't alone." 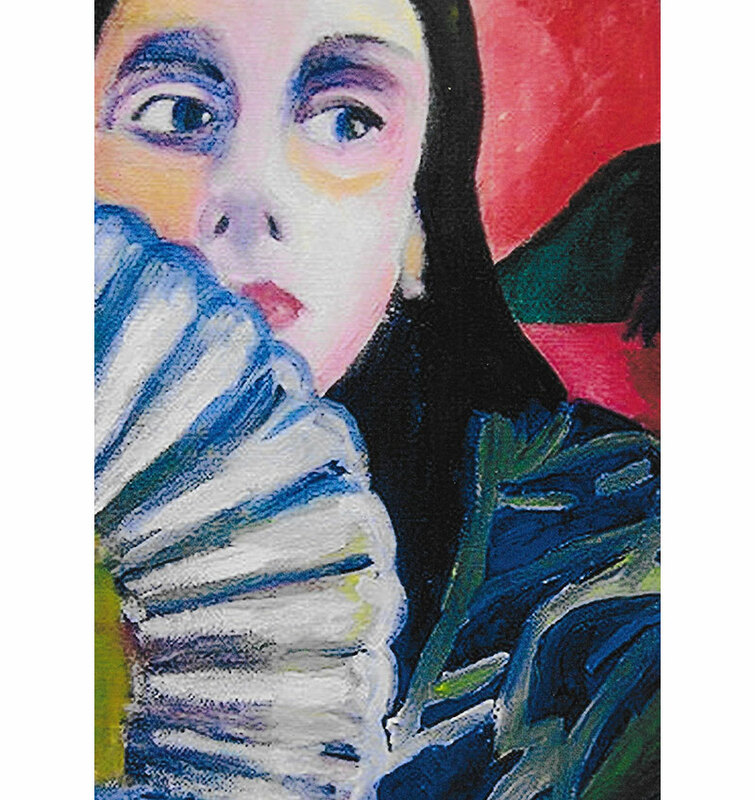 Her most recent painting, "White Fan," is a self-portrait which communicates how she feels with OCD. The fan shields herself from the OCD and the spreading anxiety is represented by the random pattern in the clothes, reaching toward her head. To find out more of Riia's story at visit www.riiatalve.com, www.riiaphotography.com and https://selfadvocatenet.com/riia-talve/.